The All Progressives Congress (APC) Wednesday moved to douse tension in the ranks of its senators and members of the House of Representatives-elect over the selection of Senator Ahmad Lawan and Hon. Femi Gbajabiamila as Senate president and speaker respectively, explaining that they are preferred by the party leadership because they are the highest ranking members in both chambers of the National Assembly. The party also said it is working to achieve consensus among its federal legislators, adding that all the aggrieved aspirants are being spoken to, to understand the position of its leaders. The National Publicity Secretary of the party, Malam Lanre Issa-Onilu, who spoke to THISDAY yesterday, said APC's leaders considered the experience and ranks of Lawan and Gbajabiamila in coming to their conclusion, explaining that their loyalty to the party over time was also a major consideration. The National Chairman of the party, Mr. Adams Oshiomhole, had on Monday night at a meeting President Muhammadu Buhari held with returning senators and senators-elect of the APC, announced the decision of the party hierarchy to adopt Lawan and Gbajabiamila as the party's candidates for president of the Senate and speaker of the House. But former Senate Leader, Senator Ali Ndume, kicked, complaining that the leaders' decision were made without consultation, dismissing it as unconstitutional and indicating his intention to challenge it. Issa-Onilu had on Monday reacted to Ndume's complaint, saying the party would not brook any act of disloyalty. But by last night, he sang a new tune, indicating that the APC was on a fire fighting mission. He said the party would push for consensus for the National Assembly's leadership positions so that election in June will be a mere formality. He, however, restated its position that it would not allow the opposition to dictate the pace in the emergence of new leadership of National Assembly. Also addressing journalists yesterday at the national secretariat of the party, the Issa-Onilu, said notwithstanding the furore created by endorsement of Lawan, as candidate for the incoming Senate presidency, the party hopes to reach out to members to ensure that there will be only one person to be put forward for each position. Contrary to reports that the party may have zoned other positions including the Speaker of the House of Representatives, Issa-Onilu said the ruling party is still at work, trying to sort out details of the zoning for the remaining leadership positions at the National Assembly. “It is not the party that will determine whether there will be election or not, and that's what I said; but by the time we announce one person standing in, with a clear majority on the floor, and anybody says that he objects to that, then that person has to come up with a candidate and back it with his number. So there will be only one person being put forward and what do you have, a consensus,” he said. On why the party decided to zone the Senate presidency to an individual rather than allowing the affected area to arrive at a consensus themselves, Issa-Onilu said the party in its own judgement believes that it will not only zone positions but that it will go as far as identifying who from a particular zone is fit and proper as a Senate president. He said APC will read out names of its preferred candidates on the floor of both legislative chambers and urge members to rectify them on the day of the inauguration, saying the party doesn't envisage a situation where two APC senators will stand as candidates for a position. While clarifying the party's position on the issue of sanctions for members found guilty of anti-party activities, Issa-Onilu said the party does not bar any of its members from expressing their desire or opinion on the issues at stake but that as loyal party men, it expects them to show solidarity and respect for party's supremacy and support any final position it has taken. Speaking on the suspension of Senator Kabiru Marafa by the Zamfara State chapter, Issa-Onilu said it is within the powers of the party's executives at the ward level to do so. On the refusal of the Independent National Electoral Commission (INEC), to issue Certificate of Return to the Imo State governor, Chief Rochas Okorocha, for the senatorial election, the party said that it is constrained to intervene because the governor is on suspension. However, when asked its position regarding the decision of the Minister of Transportation, Mr. Rotimi Amaechi, to ask APC members to support African Action Congress (AAC) in the governorship election in Rivers State, he said the party did not view his action as anti-party. Onilu said: “I will emphatically say no; because if you liken it to the situation in Imo and or Ogun States, it will be wrong. In Rivers State, APC does not have any candidate and as a party, Rivers State is very important to us. Meanwhile, there appears to be a crack in the APC senators-elect caucus over who occupies the coveted office of the Senate president among the 14 senators-elect from the North-east zone where the office has been zoned to by the ruling party. So far, two ranking senators, Lawan (Yobe North) and Ndume (Borno South) have declared their interest for the office ahead of the inauguration of the ninth Senate in June. Two of the APC senators-elect, who spoke to THISDAY on condition of anonymity Wednesday, confirmed that the national leadership of the party had by its adoption of Lawan divided the caucus of the 65-man APC senators into two straight groups to pursue the ambition of both Lawan and Ndume. Some APC senators-elect loyal to Ndume who were jolted by the adoption of Lawan by the party leadership on Monday night met immediately after the dinner with Buhari on Tuesday morning to brain storm on the next line of action. The meeting which was said to have lasted till about 4a.m. and attended by senators-elect from all the six geo-political zones agreed to pursue the ambition of Ndume to a logical conclusion by reaching out to the 43 other senators-elect from the Peoples Democratic Party (PDP). This informed why Ndume had to brief the media on Tuesday morning before heading to Maiduguri, Borno State capital to consult with his party leaders on the next line of action. THISDAY further learnt that the pro-Ndume senators have scheduled a meeting in Abuja with some PDP senators-elect this week. Pro-Lawan senators-elect, however, faulted the submission of Ndume that Lawan was imposed on the APC senators-elect by the party leadership. 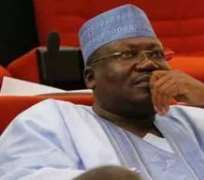 Spokesman of the Senator Ahmed Lawan for 9th Senate Presidency, Senator Sabi Abdullahi (APC Niger North), also debunked allegation made by Ndume that Lawan was imposed on the lawmakers. Ndume had on Tuesday in Abuja at a media briefing alleged that the choice of Lawan for the presidency of the 9th Senate by the National Chairman of the APC, Oshiomhole, at the presidential villa on Monday night , was imposed on the APC senators-elect and not through any consensus arrangement. Reacting to the allegation, Abdullahi told newsmen that Ndume lied as Lawan's choice emerged from recommendation made to that effect and widely accepted by majority of APC Senators-elect present at the presidential dinner. According to him, at the dinner attended by many of the APC governors and most of the Senators-elect on the platform of the party, the APC national chairman in a family affair tone, recommended Senator Lawan for the position of President of the 9th Senate which was spontaneously and instantaneously applauded by the senators – elect without any dissenting voice . He said: “It is not good for people to peddle lies. I was at the dinner along with other APC senators-elect. The National Chairman of our party, Mr. Adams Oshiomhole, never made any announcement or submission that can be described by anybody as imposition. “He in the spirit of avoiding what happened in 2015, along with the presidency, gave the required direction for the party as regards the position of President of the 9th Senate in a very persuasive and convincing tone, recommended Senator Lawan for the position. “The recommendation was spontaneously and instantaneously applauded by all the APC senators- elect in attendance without anybody dissenting. He vowed that at anytime the 9th Senate will be inaugurated, Lawan will get overwhelming votes from his colleagues for the position. According to him, “By the grace of God, on the day of inauguration, God sparing our lives, the Senate president of the ninth National Assembly will be Senator Ahmad Lawan. “I won't come here and start boasting about number but I want to tell you that on that very day. The party is responsible for zoning and the senate presidency has been zoned to the North-east. “I don't have the idea on what the party is doing on the position of deputy senate presidency. He, however, added that the 9th Senate under Lawan's presidency, will carry along the PDP senators -elect in all spheres of legislative business for the benefit of Nigeria and Nigerians. His words: “Let me tell you very clearly that we have been engaging our colleagues in the PDP and I will tell you that majority of them are actually working for us to see that we have a harmonious, rancour-free, non-tumultuous senate. Abdullahi also described as blatant lies a story making the rounds that if Lawan emerges as Senate president he will amend the constitution to allow President Buhari stay in office beyond 2023. Abdullahi described the fake news as a desperate plot concocted by “evil and desperate politicians” bent on frustrating the emergence of Senator Lawan as Senate President in the 9th National Assembly. According to the lawmaker, “When we (Senators) met the President two days ago, he (President) was very emphatic that he has stood for election five times, and this is his last. “The president's statement clearly shows that he is a full democrat who knows that our constitution only provides for second term which he has gotten, and for which he is grateful to Nigerians.